Looking for a memorable gift for a special event, holiday or friendly gathering? Go beyond the typical bottle of wine, dessert tray or fruit basket – try a gift box from Old Heidelberg Deli! We also create custom gift baskets to meet your specific needs, and will recommend an assortment of menu items that are perfectly suited for your occasion. 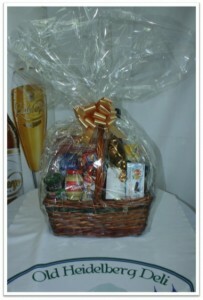 Call us today at 954.463.3880 to order a gift basket for your next event!